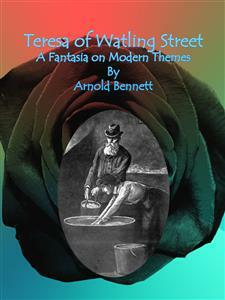 Teresa of Watling Street: A Fantasia on Modern Themes written by Arnold Bennett who was an English writer. This book was published in 1904. And now republish in ebook format. We believe this work is culturally important in its original archival form. While we strive to adequately clean and digitally enhance the original work, there are occasionally instances where imperfections such as missing pages, poor pictures or errant marks may have been introduced due to either the quality of the original work. Despite these occasional imperfections, we have brought it back into print as part of our ongoing global book preservation commitment, providing customers with access to the best possible historical reprints. We appreciate your understanding of these occasional imperfections, and sincerely hope you enjoy reading this book. TERESA AND HER FATHER WERE TRANSFERRING THE CONTENTS,. Since money is the fount of all modern romantic adventure, the City of London, which holds more money to the square yard than any other place in the world, is the most romantic of cities. This is a profound truth, but people will not recognise it. There is no more prosaic person than your bank clerk, who ladles out romance from nine to four with a copper trowel without knowing it. There is no more prosaic building than your stone-faced banking office, which hums with romance all day, and never guesses what a palace of wonders it is. The truth, however, remains; and some time in the future it will be universally admitted. And if the City, as a whole, is romantic, its banks are doubly and trebly romantic. Nothing is more marvellous than the rapid growth of our banking system, which is twice as great now as it was twenty years ago—and it was great enough then. Such were the reflections of a young man who, on a June morning, stood motionless on the busy pavement opposite the headquarters of the British and Scottish Banking Company, Limited, in King William Street, City. He was a man of medium size, fair, thick-set, well-dressed, and wearing gold-rimmed spectacles. The casual observer might have taken him for a superior sort of clerk, but the perfect style of his boots, his gloves, and his hat precluded such a possibility; it is in the second-rate finish of his extremities that the superior clerk, often gorgeous in a new frock-coat, betrays himself. This particular young man, the tenor of whose thoughts showed that he possessed imagination—the rarest of all qualities except honesty—had once been a clerk, but he was a clerk no longer. He looked at his watch; it showed three minutes to twelve o’clock. He waited another minute, and then crossed through the traffic and entered the sober and forbidding portals of the bank. He had never before been inside a City bank, and the animated scene, to which many glass partitions gave an air of mystery, would have bewildered him had he not long since formed the immutable habit of never allowing himself to be bewildered. Ignoring all the bustle which centred round the various cash desks lettered A to F, G to M, and so on, he turned unhesitatingly to an official who stood behind a little solitary counter. ‘Sir?’ said the official blandly; it was his sole duty to be bland (and firm) to customers and possible customers of an inquiring turn of mind. ‘I have an appointment with Mr. Simon Lock,’ said the young man. The official intensified his blandness at the mention of the august name of the chairman of the British and Scottish Banking Company, Limited. ‘Mr. Lock is engaged with the Board,’ he said. ‘I have an appointment with the Board,’ said the young man. ‘My card;’ and he produced the pasteboard of civilization. ‘In that case,’ said the official, now a miracle of blandness, ‘be good enough to step this way.’ Mr. Richard Redgrave stepped that way, and presently found himself in front of a mahogany door, on which was painted the legend, ‘Directors’ Parlour’—not ‘Board Room,’ but ‘Directors’ Parlour.’ The British and Scottish was not an ancient corporation with a century or two of traditions; it was merely a joint-stock company some thirty years of age. But it had prospered exceedingly, and the directors, especially Mr. Simon Lock, liked to seem quaint and old-fashioned in trifles. Such harmless affectations helped to impress customers and to increase business. The official knocked, and entered the parlour with as much solemnity as though he had been entering a mosque or the tomb of Napoleon. Fifty millions of deposits were manoeuvred from day to day in that parlour, and the careers of eight hundred clerks depended on words spoken therein. Then Mr. Richard Redgrave was invited to enter. His foot sank into the deep pile of a Persian carpet. The official closed the door. The specialist was alone with three of the directors of the British and Scottish Bank. The other directors did not look up. All three were rapidly signing papers. Richard occupied a chair upholstered in red leather, next the door, and surveyed the room. It was a large and lofty apartment, simply but massively furnished in mahogany. A table of superb solidity and vast acreage filled the middle space—such a table as only a bank director could comfortably sit at. As Richard gazed at that article of furniture and listened to the busy scratching of pens, he saw, with the prophetic vision characteristic of all men who are born to success, that a crisis in his life was at hand. He had steadily risen throughout his brief life, but he had never before risen so high as a bank parlour, and the parlour of such a bank! His history, though a short one, was curious. He came to London from Westmoreland at the age of nineteen as a clerk in the Customs. From the first he regarded his clerkship merely as a means to an end; what end he had yet to ascertain. He paid particular attention to his clothes, joined a large political club, and kept his eyes open. His personal stock-in-trade consisted of a rather distinguished appearance, a quiet, deliberate, and confident voice and manner, an imperturbable good temper which nothing could affect, and a firm belief that he could do anything a little better than the average doer of that thing. He desired a University degree, and by working at night for four years obtained the M.A. of London. He practised a little journalism of the sensational kind, and did fairly well at that, but abandoned it because the profits were not large enough. One Sunday he was cycling down the Portsmouth Road, and had reached an hotel between twenty and thirty miles from London, when he met with his first real chance. A motor-tricycle had unaccountably disappeared from the hotel during luncheon. The landlord and the owner of the tricycle were arguing as to the former’s liability. Redgrave listened discreetly, and then went to examine the barnlike coach-house from which the motor-tricycle had been spirited away. Soon the owner, who had instructed the police and bullied the landlord, and was now forced to kick his angry heels till the departure of the afternoon train back to London, joined him in the coach-house. The two began to talk. ‘You are Lord Dolmer,’ said Redgrave at length. ‘How do you know that?’ asked the other quickly. He was a black-haired man of forty, simply dressed, and of quiet demeanour, save of unusual excitement. Lord Dolmer was impressed by the youth’s manner. ‘Who are you? You seem to know something,’ said Lord Dolmer. ‘I fancy I could trace your tricycle, if you gave me time,’ he said. ‘I will give you not only time, but money,’ the peer replied. ‘We will talk about that later,’ said Redgrave. Until that hour Richard had no thought of assuming the rôle of detective or private inquiry agent; but he saw no reason why he should not assume such a rôle, and with success. He calmly determined to trace the missing tricycle. By a stroke of what is called luck, he found it before Lord Dolmer’s train left. Over half of the coach-house was a loft in the roof. Richard chanced to see a set of pulleys in the rafters. He climbed up; the motor-tricycle was concealed in the loft. The landlord, confronted with it, said that of course some mischievous loiterers must have hoisted it into the loft as a practical joke. The explanation was an obvious one, and Lord Dolmer was obliged to accept it. But both he and Redgrave had the gravest suspicions of the landlord, and it may be mentioned here that the latter is now in prison, though not for any sin connected with Lord Dolmer’s tricycle. ‘What do I owe you? Name your own sum,’ said Lord Dolmer to Redgrave. ‘Nothing at all,’ Redgrave answered. He had come to a resolution on the instant. ‘Give me some introductions to your friends. Lord Dolmer was poor—for a lord—and eked out a bare competence by being a guinea-pig in the City, a perfectly respectable and industrious guinea-pig. He agreed to Redgrave’s suggestion, asked him to dinner at his chambers in Half Moon Street, and became, in fact, friendly with the imperturbable and resourceful young man. Redgrave obtained several delicate commissions, and the result was such that in six months he abandoned his post in the Customs, and rented a small office in Adelphi Terrace. His acquaintance with Lord Dolmer continued, and when Lord Dolmer, after a lucky day on the Exchange, bought a 5-h.p. motor-car, these two went about the country together. Redgrave was soon able to manage a motor-car like an expert, and foreseeing that motor-cars would certainly acquire a high importance in the world, he cultivated relations with the firm of manufacturers from whom Lord Dolman had purchased his car. Then came a spell of ill-luck. The demand for a private inquiry agent of exceptional ability (a ‘specialist,’ as Richard described himself) seemed to die out. Richard had nothing to do, and was on the point of turning his wits in another direction, when he received a note from Lord Dolmer to the effect that Mr. Simon Lock and the directors of the British and Scottish had some business for him if he cared to undertake it. Hence his advent in King William Street. Redgrave bowed, and the two financiers nodded. ‘Take that chair, Mr. Redgrave,’ said Simon Lock, indicating a fourth chair at the table. Simon Lock, a middle-aged man with gray hair, glinting gray eyes, a short moustache, and no beard, was one of the kings of finance. He had the monarchical manner, modified by an occasional gruff pleasantry. The British and Scottish was only one of various undertakings in which he was interested; he was, for example, at the head of a powerful group of Westralian mining companies, but here, as in all the others, he was the undisputed master. When he spoke Lord Dolmer and Sir Charles Custer held their tongues. ‘Highly suspicious,’ murmured Sir Charles Custer, M.P., out of his beard. ‘You naturally—shall I say?—resent eccentricity in any member of your staff?’ said Richard sagaciously. ‘Just so,’ said Simon Lock, pleased. ‘Just so,’ echoed Sir Charles Custer. Lord Dolmer gave his protégé a smile of satisfaction. ‘I will undertake to assuage your curiosity on these points,’ Redgrave said, with that air of serene confidence which came so naturally to him. ‘And your fee?’ asked Simon Lock. That evening Richard strolled up the Edgware Road to Kilburn, and looked at the exterior of the Kilburn branch of the British and Scottish. It presented no feature in the least extraordinary. Richard was less interested in the bank than in the road, the magnificent artery which stretches, almost in a straight line, from the Marble Arch to Chester. Truly the Roman builders of that road had a glorious disregard of everything save direction. Up hill and down dale the mighty Watling Street travels, but it never deviates. After sixty years of disuse, it had resumed its old position as a great highway through the magnificence of England. The cyclist and the motorist had rediscovered it, rejuvenating its venerable inns, raising its venerable dust, and generally giving new vitality to the leviathan after its long sleep. To Richard Redgrave it seemed the avenue of adventure and of success. His imagination devoured the miles between Kilburn and Dunstable, and he saw the solitary farmhouse of Raphael Craig, bank manager, motorist, and inheritor of a hundred thousand pounds in virgin silver coin. Aweek later—and in the meantime he had been far from idle—Richard Redgrave arrived in Dunstable. It was a warm, sunshiny, sleepy day, such as suited that sleepy town, and showed off its fine old church and fine old houses to perfection. There is no theatre in Dunstable, no concert-hall, and nothing ever excites this staid borough save a Parliamentary election or the biennial visit of Bosco’s Circus. On the morning of Richard’s arrival Dunstable was certainly excited, and the occasion was Bosco, who, with his horses, camels, elephants, lions, bears, acrobats, riders, trapezists, and pavilions, had encamped in a large field to the south of the town. Along the whole of its length Dunstable, which consists chiefly of houses built on either side of Watling Street for a distance of about a mile and a half, was happily perturbed by the appearance of Bosco’s gigantic, unrivalled, and indescribable circus, which was announced to give two performances, at two-thirty and at seven-thirty of the clock. And, after all, a circus which travels with two hundred horses (chiefly piebald and cream), and with a single tent capable of holding four thousand people, is perhaps worthy to cause excitement. Richard determined to patronize Mr. Bosco’s entertainment—he thought he might pick up useful information in the crowd—and at two-thirty he paid his shilling and passed up the gorgeous but rickety steps into the pavilion. A brass band was playing at its full power, but above the noise of the trumpets could be heard the voice of the showman—not Bosco himself, but an individual hired for his big voice—saying, ‘Step up, ladies and gentlemen. Today happens to be the thirtieth anniversary of our first visit to this town, and to celebrate the event we shall present to you exactly the same performance as we had the honour of presenting, by special command, to Her Majesty the Queen at Windsor last year. Step up, step up, and see our great spectacle, the Relief of Mafeking! See the talking horse! See Juana, the most beautiful rider in the world! Step up! Children half-price to morning performance only.’ The big voice made precisely this speech every day of his life all over England. The circus was well filled, and the audience enthusiastic. The clowns had an enormous success. As for Richard, he was more interested in Juana, the horsewoman. She was a tall and beautiful girl, apparently of the Spanish type. She rode, in a strictly conventional park riding costume, a superb strawberry-roan mare, which at her command waltzed, circled, caracoled, and did everything except stand on its head. Mare and rider were equally graceful, equally calm and self-contained. It was a charming item in the programme, but somewhat over the heads of the audience, save a few who knew a born rider when they saw one. An elephant was brought in, a young man in Indian costume being perched on its neck. The mare and the elephant went through a number of evolutions together. Finally the mare reared and lodged her forepaws on the elephant’s tremendous flank, and so situated the strange pair made an exit which roused the house from apathy to wild enthusiasm. Juana was vociferously recalled. She re-entered on foot, holding her habit up with one hand, a light whip in the other. Richard could not help being struck by the rather cold, sad, disdainful beauty of the girl’s face. It seemed wrong that the possessor of such a face should have to go through a series of tricks twice daily for the diversion of a rustic audience. ‘That wench is as like Craig’s girl as two peas.’ Richard turned quickly at the remark, which was made by one of two women who sat behind him industriously talking. The other agreed that there was some likeness between ‘Craig’s girl’ and the lovely Juana, but not a very remarkable one. Richard left his seat, went out of the pavilion, and walked round the outside of it towards the part where the performers entered the ring. Attached to the pavilion by a covered way was a smaller tent, which was evidently used as a sort of green-room by the performers. Richard could see within, and it happened that he saw Juana chatting with a girl who was very much like Juana, though rather less stately. The young man in Indian costume, who had ridden the elephant, was also of the group. Soon the young man went to another corner of the tent, and the two girls began to talk more rapidly and more earnestly. Lastly, they shook hands and kissed, Juana burst into tears, and her companion ran out of the tent. Richard followed her at a safe distance through the maze of minor tents, vans, poles, and loose horses, to the main road. A small, exquisitely-finished motor-car stood by the footpath; the girl jumped on board, pulled a lever, and was off in a northerly direction through Dunstable up Watling Street. ‘Is that the road to Hockliffe?’ he asked a policeman. He went back to see the rest of the performance, and he had scarcely sat down before he had cause to wish that he had remained outside. The famous strawberry-roan mare, formerly ridden by Juana, was making a second appearance as the talking horse, in charge of the young man who had shone before in Indian costume, but who now wore the dress of a riding-master. An attendant was walking along the front benches with a bundle of numbered cards. He offered one to Richard, and Richard thoughtlessly accepted the offer. From that moment the eyes of the entire assemblage were upon him. Richard was disgusted at being thus made the centre of a trick, but there was no help for it. ‘What is the number of the card drawn by the gentleman?’ the young man demanded of the mare. She stamped her foot ten times on the tan. It was so. Richard nodded. Loud applause. The mare shook her head. Laughter. The mare lowered her head. More laughter. The mare lowered her head again. Loud laughter. Again the mare signed an affirmative. Shrieks of laughter. The mare kicked out with her hindlegs, and ran as if horror-struck from the ring, amid roars of rustic delight. This simple trick and joke, practised for years and years with all kinds of horses, had helped as much as anything to make the fortune of Bosco’s circus. It never failed of its effect. The final ‘turn’ of the show was the Relief of Mafeking. Under cover of the noise and smoke of gunpowder, Richard contrived to make a stealthy exit; he was still blushing. As he departed he caught a last glimpse of Juana, who came into the ring in the character of a Red Cross nurse on the field of battle. That evening at midnight Richard issued forth from the Old Sugar Loaf Hotel on a motor-car. Bosco’s circus was already leaving the town, and as the straggling procession of animals and vehicles wandered up Watling Street under the summer moon it made a weird and yet attractive spectacle—such a spectacle as can be seen only on the high-roads of England. Its next halting-place was eighteen miles north—a long journey. The cavalcade was a hindrance to Richard, for he particularly desired to have Watling Street between Dunstable and Hockliffe to himself that night. He waited, therefore, until the whole of Bosco had vanished ahead out of sight. The elephants, four in number, brought up the rear of the procession, and they were under control of the young man whose trick with the strawberry-roan mare had put Richard to the blush. There was no sign of the mare nor of Juana. Watling Street runs through a deep chalk-cutting immediately to the north of Dunstable, and then along an embankment. This region at the foot of the Chiltern Hills is famous for its chalk, which is got from immense broad pits to the west of the high-road. As Richard’s car ran through the cutting—it was electrical, odourless, and almost noiseless—he perceived in front of him the elephant herd standing in the road. A little further on he descried the elephant-keeper, who was engaged in converse with a girl. Leaving his motor-car to take care of itself, Richard climbed transversely up the side of the cutting, and thus approached nearer to the pair. He saw now, in the brilliant white radiance of the moon, that the girl was the same girl who had kissed Juana in the circus tent. She was apparently urging the man to some course of action at which he hesitated. Then the elephant-keeper called aloud to his elephants, and the man and the girl, followed by the elephants, and followed also by Richard, passed through an open gate at the northern end of the cutting, and so crossed a very large uncultivated field. The extremity of the field descended steeply into a huge chalk-pit, perhaps a hundred yards in circumference and sixty feet deep, by means of a rough cart-track. At the end of the cart-track, in the bottom of the pit, was a motorcar. Richard watched the elephant-keeper single out one of the elephants and attach it by ropes to the motor-car. Slowly the ponderous and docile creature dragged the vehicle up the steep cart-track. The girl clapped her hands with joy. ‘If she is Craig’s daughter——’ Richard exclaimed softly, and then stopped. Silhouetted sharply against the night-sky was the figure of Juana on the strawberry-roan. Mare and rider stood motionless at the top of the cart-track, and Richard, from his place of concealment, could see that Juana was gazing fixedly into the chalk-pit The man with the elephants and the girl with the motor-car had not perceived her, and before they could do so she had ridden off down the field. It was a wonderful apparition, a wonderful scene—the moon, the vast hemisphere of the purple sky, the glittering and immense whiteness of the chalk-pit, the exotic forms of the elephants contrasted with the motor-car, and, lastly, the commanding and statuesque equestrian on the brow. Richard was quite impressed by the mere beauty and strangeness, as well as by the mystery, of it all. What did it mean? Why should Juana, an expert who would certainly receive a generous salary, be riding at one o’clock a.m., seeing that the principal performers, as Richard knew, usually travelled by train from one town to the next? And why should she have followed these other two—the elephant-keeper and the young girl who so remarkably resembled herself? And having followed them and observed their movements, why should she silently depart, without making known her presence? He had been able to examine Juana’s face in the strong moonlight, and again he was moved by its sad, calm, cold dignity. Juana seemed as though, at the age of twenty-five or so—she could not be more—she had suffered all the seventy and seven different sorrows which this world is said to contain, and had emerged from them resolute and still lovely, but with a withered heart. Her face almost frightened Richard. With infinite deliberation the elephants and the motor-car arrived at the top of the cart-track. The three elephants not engaged in hauling appeared to have formed a prejudice against the motor-car; the fourth, the worker, who had been used to dragging logs of teak in India, accepted his rôle with indifference. He pulled nonchalantly, as if he was pulling a child’s go-cart, thus, happily, leaving the keeper free to control the other beasts. At length the cortège—it had all the solemnity of a funeral pageant—passed safely into the field and out of Richard’s sight towards the highroad. He heard the spit, spit of the petrol-engine of the motor-car, now able to move of itself on the easy gradient, and simultaneously a startling snort and roar from one of the elephants. It occurred to him to hope that the leviathan had not taken it into his gigantic head to wreck the machine. The notion was amusing, and he laughed when he thought how frail a thing a motor-car would prove before the attack of an elephant’s trunk. Then he proceeded duly towards the road, hugging the hedge. Once more he heard the snort and the roar, and then a stern cry of command from the keeper, a little scream from the girl, and an angry squeak from the elephant. The spit, spit of the motor-car at the same moment ceased.